Hi! 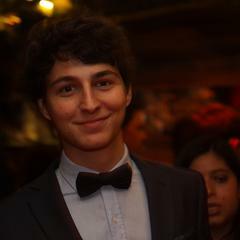 My name is Diego and I am a third-year Physics and Philosophy spanish student at King’s College London Univeristy. I have been a tutor for several years - recently focusing on GCSE and A-level Maths, Physics and Spanish. I have always received very good feedback since I usually have a very good rapport with my students. I am very dedicated and always prepare my lessons ahead. How do I solve 5y^2 + 24y = 0? What subtopics are in Edexcel GCSE Physics topic 1: key concepts in physics? Adam is going on holiday to Turkey. The exchange rate is £1=4.2601 lira. Adam changes £630 to lira. Work out how many liras he should get , give your answer to the nearest lira?